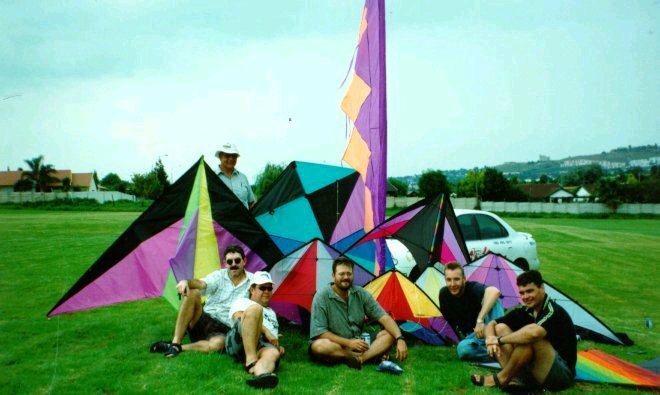 DOLDRUMS KITE CLUB HAS UNFORTUNATELY GONE INTO HYBERNATION FOR THE TIME BEING. YOU ARE STILL WELCOME TO SEND US E-MAILS. 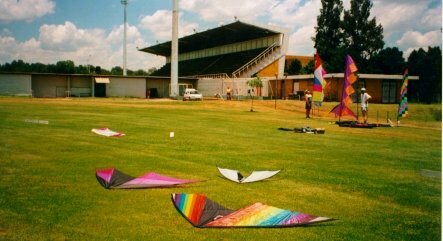 Doldrums is a kite club in Gauteng, South Africa, with members from Pretoria and all over the greater Johannesburg. The club started in all earnest at the beginning of 1998 and is growing with leaps and bounds, attracting attention from flyers all over the province. I wonder why we decided to call the club "The Doldrums"??? This is a fairly typical picture depicting normal conditions on the South African Highveld. All the kites in the foreground are light wind kites, which is mainly what we fly up here. Our rules - We have only one, very important, rule: NO POLITICS!! Kite arch - our first club project! Want to join the KiteRing Connects People?